PAWSitive Pups Steam Class organized a Pet Food Drive for dogs and cats of Randolph County! Food donated went to support the Randolph County SPCA in filling their pet pantry. The SPCA pet pantry provides temporary assistance for Randolph County residents in feeding their pets and supplies food for the feral cat colonies that are part of the Trap-Neuter-Return program. PAWSitive Pups delivered the dog and cat food to the RCSPCA and donated $50 on Flex Day, Friday, March 22nd. 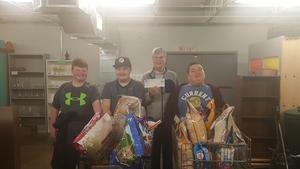 Thank you to those that donated to the pet food drive! !